Finally…Fast and Easy Deck and Shed Footings to Save You Time and Money Building Your Outdoor Projects! 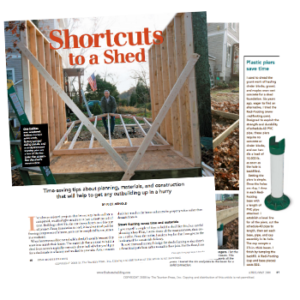 Building a deck, shed — or any outdoor structure — can be both challenging and rewarding. There’s nothing like using your own hands to build something that’s such a big part of a home. A lot of sweat goes into it but, when you’re done building…it’s a pretty good feeling. But there’s one part of the building process that always proves challenging and rarely enjoyable: Dealing with messy concrete and wasting days setting the footings! Why waste valuable time with messy concrete? Anyone who has ever mixed concrete knows it’s the messiest part of the building process. And concrete can be structurally imperfect unless your cement is mixed exactly as required. Throw in the daunting task of moving, mixing, and pouring concrete and you add 2-3 days onto your project — before you even get a whiff of sawdust. We spent 10 years in research and development to make sure RediFooting was scientifically proven to be stronger than concrete. RediFooting eliminates the dangerous inconsistency of poorly mixed bags of cement. Made of high-strength, high-density polypropylene, RediFooting is laboratory tested to have a compressive strength of 3821 pounds per square inch (PSI). 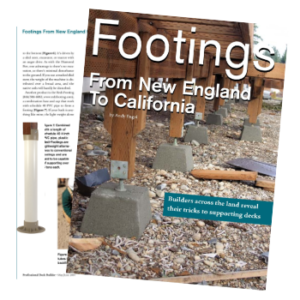 Simply put, RediFooting replaces the need for concrete footings because it’s stronger, easier to install, better looking and has the consistent quality concrete footings lack. Forget Carrying Around 50-80 Pound Bags of Cement. Weighing less than 9 pounds each (once assembled), RediFooting is extremely portable so you can avoid injury to your back. The light weight makes each footing easy to handle and move around your work site until you drop it in the hole. And unlike bags of cement — which solidify over time with moisture commonly found in a garage or basement — RediFooting can be easily stored for later use without any issues or problems. Store RediFooting in your garage or shop until you’re ready to build your deck or place your shed. For each concrete footing, you’ll be mixing three to five bags of cement per each hole. That means lifting 350 pounds, hoping the bags don’t tear…pouring each bag into your mixer or wheel barrel…adding just the right amount of water and additives…moving your mix as close to the hole as possible. Then waiting for 2-3 days for your footings to be ready (if the weather and temperature are just right). Each RediFooting set includes the cap, base, and all required hardware for just $32.95 each plus shipping. All you have to add is the PVC schedule 40 (220 psi), available at any home improvement store. RediFootings are so easy to use, in just a few steps you can get started with the fun part of actually building your deck. Once you’ve assembled your RediFootings with the required 4-inch schedule-40 PVC pipe, you’re ready to start building with just a few simple steps! 1. 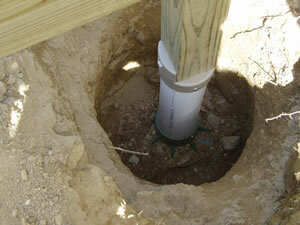 Cut the PVC to proper lengths (per local code) and assemble each footing in under 3 minutes. 2. Dig the holes to the required frost-line depth. 3. Drop in your RediFooting. 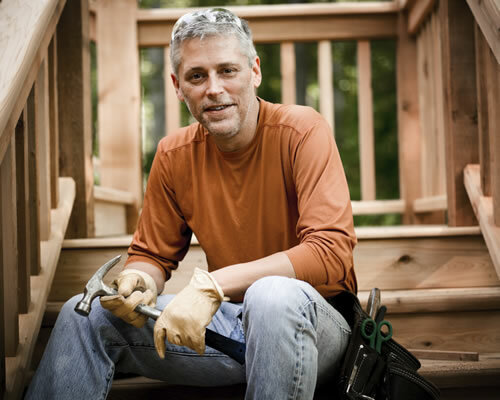 Within an hour or less, you’re building your deck or shed! 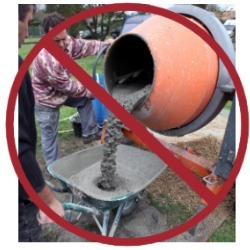 You won’t have to spend a day mixing concrete, having someone else hold a barrel still as you try to pour the concrete into your holes without wasteful spills. And don’t worry if your RediFooting is out of place or misaligned. If, by chance, your holes are off…it’s never too late to move or shift your footings for better placement! Try moving a 42-inch deep concrete footing! 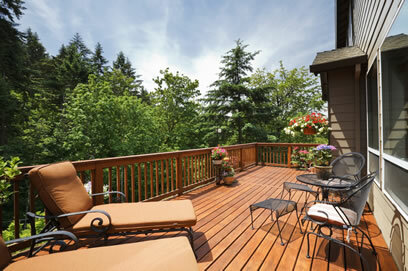 Ready to start building your deck, shed, or outdoor structure? Start building your deck or shed right away the easy way with RediFooting deck and shed footings. To get started, just click the button below to order RediFooting or call us today (866) 586-6082. For any inquiries, please contact the office by phone at (866) 586-6082 (toll free) – Monday through Friday, 9am – 3pm EST.